The officials in this one seemed very questionable too. 1. Charles Sims races 31 yards to launch WVU’s comeback. Facing a 17-3 deficit in the second quarter, West Virginia was playing the knockout victim to script—at least until Sims raced over left end to cap a three-play, 87-yard drive. Sims’ scoring burst was an easy jaunt through the left-side gap created by tight end Cody Clay blocking down on the defensive end and pulling guard Mark Glowinski locking up a linebacker. “The end crashed down, so I followed the (pulling) guard, and the hole just came wide-open,” said Sims, who finished with 154 yards on 24 carries, both season-highs. 2. 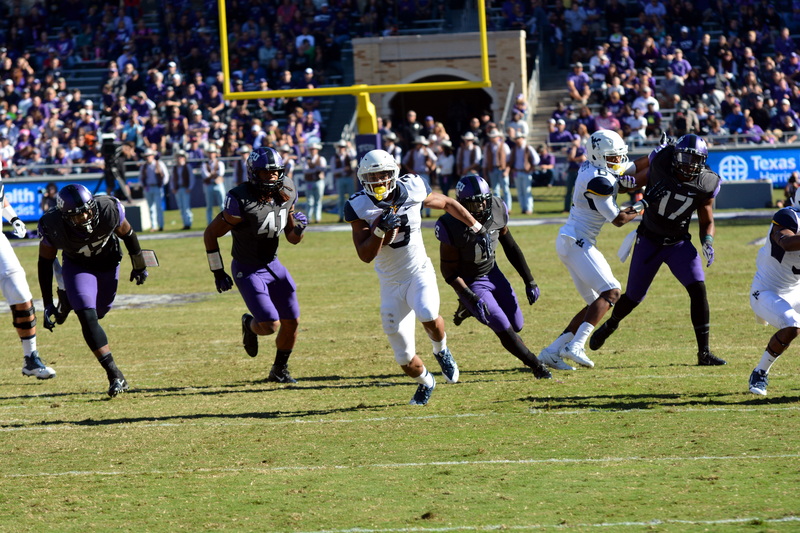 Clint Trickett’s pick-six erased by holding penalty on TCU’s Jason Verrett. Frogs linebacker Chris Hackett picked off Trickett’s worst pass of the day and returned it 37 yards for a would-be touchdown. But a few yards away from the spot of the turnover lay a flag, where Verrett was ruled to be holding receiver Kevin White, who was not making a play on the underthrown ball.